Collection of 14 instrumental requiems explore the bittersweet ebb and flow of tender, sorrow, awe, and longing. The movements are gentle, steady and slow. Composed for small ensembles of piano, string, wind and percussion chamber instruments performed and digitally arranged by Rosette. Tech note: 1 check your volume control, and or check to see if QuickTime Player (free) is loaded on your computer. If not, you can get it at Apple free downloads. A high speed dsl helps or have to wait a while for the download. 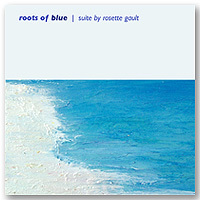 roots of blue: collection of 14 for piano and classical instruments.